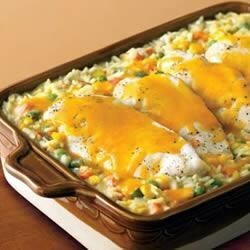 "So many favorite flavors and ingredients--chicken, Cheddar cheese, and vegetables--are in this one easy casserole." Stir the soup, water, rice, vegetables and onion powder in a 12 x 8 inch shallow baking dish. Top with chicken. Season chicken as desired. Cover. Bake at 375 degrees F for 45 minutes or until done. Top with cheese. This one-pot Mexican classic is easy and packed with flavor. Italian: In place of onion powder, use 1 teaspoon Italian seasoning. Substitute 1/3 cup shredded Parmesan for Cheddar. Mexican: In place of onion powder, use 1 teaspoon chili powder. Substitute Mexican cheese blend for Cheddar.